Description: This is another of Ishikawa Toraji's landscape prints. 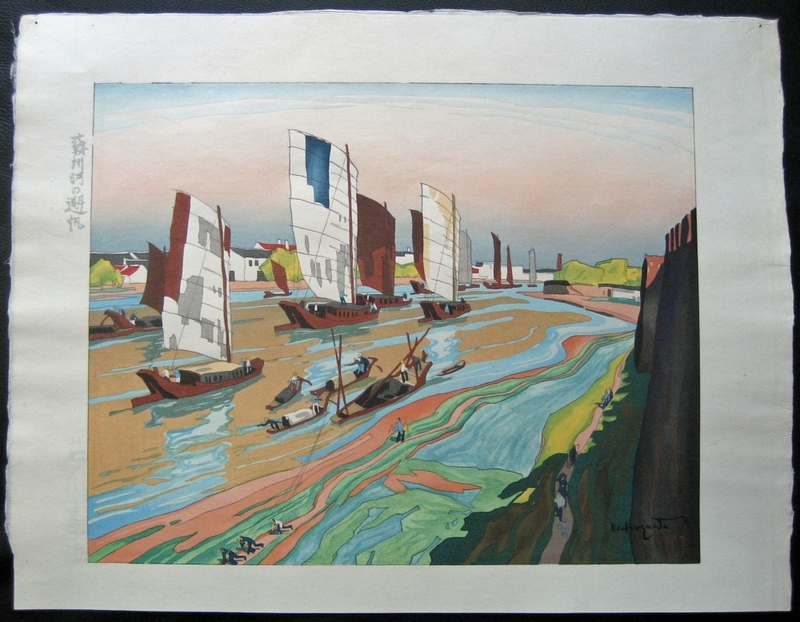 I've only come across 6 'landscape' prints, 3 showing mountains (2 appear to be of Mount Fuji, the other a mountain range) and 3 are of harbour/river boat scenes. The print has an image size of 14 3/4" wide x 11 3/4" high and sheet size of 19" wide x 14 3/4" high. There is some mat burn in the print due to poor quality framing materials being used. Toraji is probably best known for his series 'Rajo jusshu (Ten female nudes)'. Update 20/12/2012: The print has been professionally treated and its image re-uploaded to the site. The mat burn in the image and margin creasing has been lessened and the colours now appear brighter.